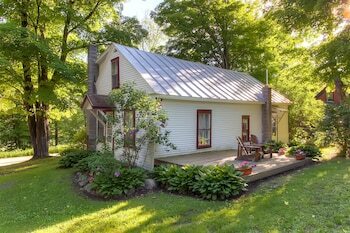 Located in Bridgewater Corners, this cottage is within a 15-minute drive of Long Trail Brewing Company and Calvin Coolidge Historic Site. Free self parking is available onsite. When you stay at this villa in Bridgewater Corners, you'll be near ski lifts and 6 minutes by car from Long Trail Brewing Company. Free self parking is available onsite. Located in Pittsfield, this vacation home is within a 15-minute drive of Gifford Woods State Park and Green Mountain National Golf Course. Free self parking is available onsite. When you stay at Birch Ridge Inn in Killington, you'll be next to a golf course, within a 5-minute drive of Killington Golf Course and Killington Resort. Free self parking is available onsite. With a stay at Mountain Sports Inn in Killington, you'll be on the Strip, within a 10-minute drive of Killington Resort and Gifford Woods State Park. Free self parking is available onsite. With a stay at Fall Line Condominiums in Killington, you'll be within a 5-minute drive of Killington Resort and Killington Golf Course. Free self parking is available onsite. With a stay at Highridge Condominiums in Killington, you'll be next to a golf course, within a 10-minute drive of Killington Resort and Killington Golf Course. Free self parking is available onsite. Located in South Woodstock, Kedron Valley Inn is in a rural location, within a 10-minute drive of Dana House Museum and Woodstock Town Hall Theatre. Free self parking is available onsite.